If this sounds like we are gushing well that is because we are. 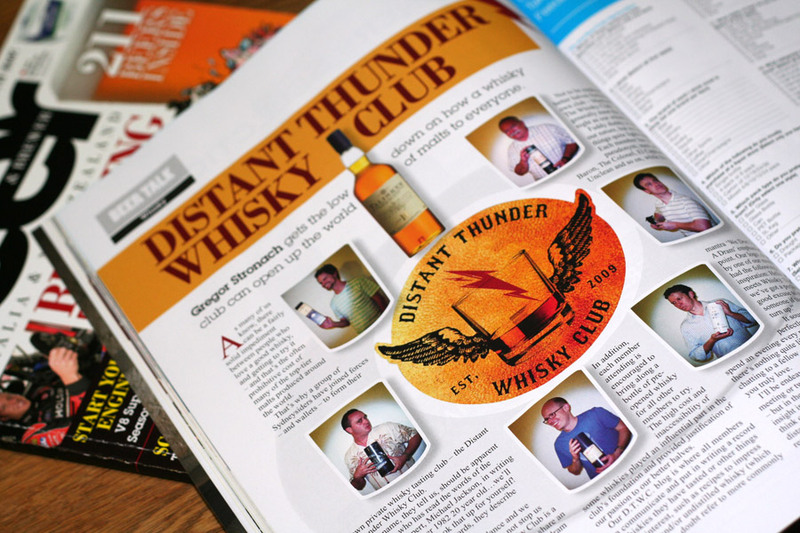 The Distant Thunder Whisky Club rumbles on to the pages of immortality with the club profiled in Beer & Brewer Magazine. Yes we are that ugly but don't let the pouting or the fact we are not wearing any pants in the photos put you off. Tasteful as the photos are it is all well above board, but what happens in whisky club stays in whisky club. If you are not an avid reader of the mag like several of the club members are (due to our home brewing dabbling and general beer obsessions), keep an eye out for the current Issue 20 Autumn 2012. Beer & Brewer Magazine is easily found in any Dan Murphys store or home brew shops, and I have also seen it in many News Agencies. From all members of the D.T.W.C. (only half shown in the photos) a big thanks to Gregor Stronach and Beer & Brewer Magazine for getting in contact to find out more about us. We Salute You! This is a non-sponsord promotion. For any further details please defer to the Beer & Brewer Magazine website.